Brown rice is a staple in my home. A simple bowl of steamed brown rice, whether it is short-grain, long-grain, basmati or jasmine is utterly satisfying to me. I love the nuttiness and wholesomeness of brown over white. Keeping the rice whole, with the bran and germ layers intact, gives you loads of fiber as well as protein, minerals and essential fatty acids that are stripped away if the grain is polished to white. Just as those layers protect the kernel of rice, they’ll protect you, too. Sure, brown rice takes 45-50 minutes to cook, as opposed to 20 minutes for white, so that’s why I make a huge batch early in the week and have it on the ready for breakfast, lunch, dinner and snacks. 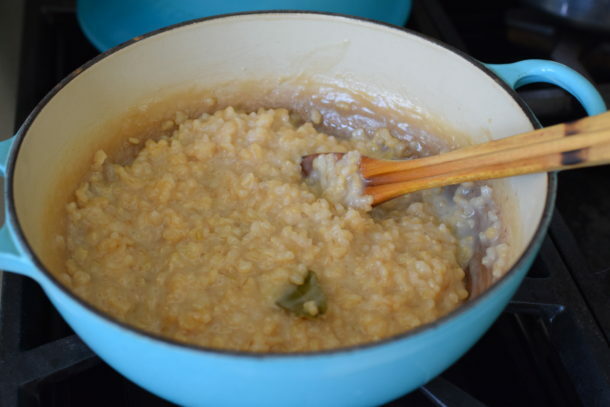 Are you skeptical about the use of bay leaves in rice pudding? When my Puerto Rican mother-in-law suggested it to me, I was too. But it really adds an interesting earthy, floral note to the creamy rice. It’s definitely not a deal-breaker, though. Please make this whether you have bay leaves or not. One ingredient my M-I-L did NOT suggest was using brown rice syrup as a sweetener. That’s my addition and one of my favorites in the “less refined sweeteners” category. Brown rice syrup is made by cooking down soaked and sprouted brown rice with an enzyme that breaks the starches into maltose. It is light and honey-like, but not as sweet with a butterscotch undertone. 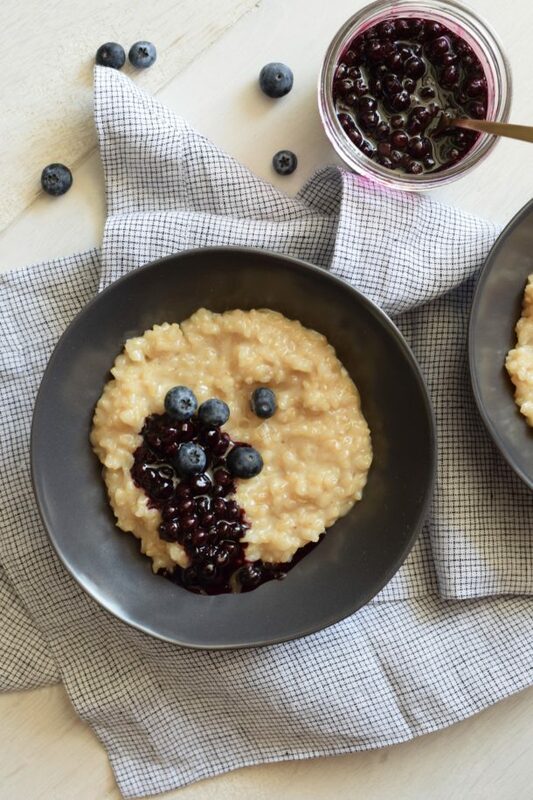 This brown rice pudding started off as a snack/dessert, but I realized it could do double duty as weekday morning breakfast, especially when everyone is looking for something warm other than oatmeal for a change. Like I do when I make a big pot of oatmeal for a family breakfast, I set up a “topping bar” for the brown rice pudding. Each person can choose his or her own favorites add-ons. There is always fresh seasonal fruit, such as berries or peaches; dried fruit like Goji berries or blueberries; raw almonds or walnuts; raw cacao nibs; maple sugar and ground cinnamon. This beats a cold bowl of processed cereal any day! Whisk together coconut milk, almond milk and brown rice syrup until blended. Place the cooked brown rice in a medium, heavy-bottomed pot. 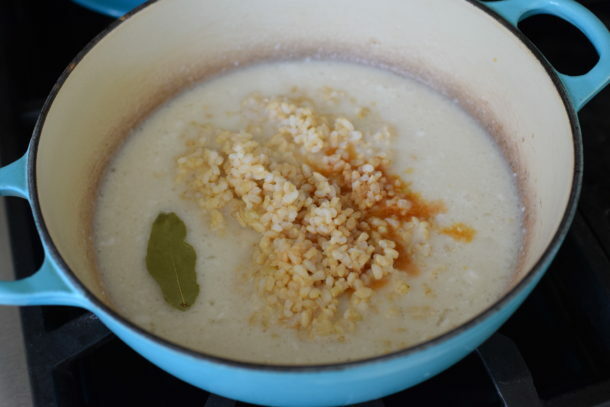 Add coconut milk mixture, vanilla bean, bay leaf and salt. 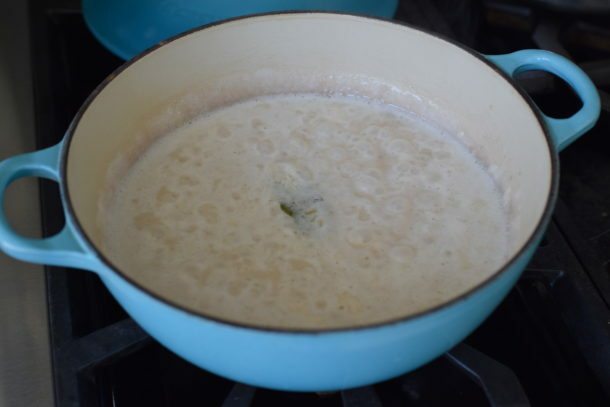 Bring to a gentle boil and simmer until most of the liquid has been absorbed by the rice, but is still creamy, about 20 minutes. Turn off heat and remove vanilla bean and bay leaf. Serve warm or room temperature. Pudding will thicken as it sits. Mmmm yummy. I just made this as I needed a gluten free dessert treat for a friend. I didn’t have the coconut milk but mixed almond vanilla and almond coconut milk and I used fresh honey instead of the rice syrup and also goji berries! It’s delicious!! Oooh, goji berries take this up a notch! Nice! Instead of steaming brown rice have you ever boiled it like pasta? I do this quite often and like you I cook a large batch so I will have rice for the week. Great point to bring up, Audrey! Yes, I have been cooking my rice that way exclusively since I learned more about the high concentration of arsenic in rice. It actually cooks faster, too. Thanks! The bay leaf is used when the dish is made more on the sweet side? The bay leaf adds an earthiness, but it doesn’t take away from the sweetness at all. It’s optional if you don’t have it. How do you cook brown rice? Is it 2/1 like white rice? my brown rice is never fluffy. Couple of tips I can give you that seem to work for me: rinse your rice before cooking to get rid of any excess starch; make sure you have a pot that’s neither too big nor too small; do NOT stir, touch, peek at your rice while cooking; 2 to 1 water to rice is usually a good bet with brown rice. I also like it to steam a bit after it finishes cooking with the lid on, but heat off. Good luck! in the water when I cooked the rice, and the rice actually absorbed the cinnamon flavor; I also added ground cinnamon and nutmeg to the finished product. Thanks for all the great tips! Cinnamon stick in the water for the rice — GENIUS! Thank YOU for the great tip. I made the pudding yesterday with goat’s milk. The rice syrup tasted very “ricey” by itself – I had to put my finger in the jar since I never used it before- but it blended very well in the pudding. We added blueberries and walnuts and we had a wonderful breakfast! I am going to incorporate rice syrup when I bake something sweet. I love the fact that is a relatively healthy alternative . Thank you Pamela for introducing it! Good to know that goat’s milk is a good substitute for almond milk. This is one of my family’s favorite breakfasts! 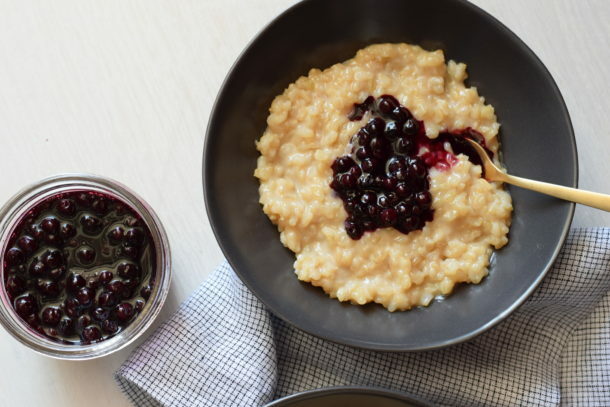 Does instant brown rice work in the brown rice pudding recipe? And are any health benefits lost by using instant brown rice instead of slow cooking? Maria — Good question! Unlike instant oats versus steel cut oats, there is no significant difference in the nutrient profile of instant brown rice versus regular brown rice. Instant brown rice has been parboiled, which leaves the outer bran layer open and able to absorb water more easily and quickly when you cook it. Enjoy! This is so delicious! I have a sweet tooth and in the morning I just crave for this! definitely my favorite breakfast dish!